Image caption Jill Stein insists her campaign observed the "highest standards of transparency and integrity"
The top US congressional committee investigating Russian interference in the 2016 election is now looking into the Green Party candidate. The Senate Intelligence Committee has requested Jill Stein turn over specific documents, according to a BuzzFeed News report. Ms Stein said in a statement that she was sharing "all communications relevant". She said her campaign had observed the highest standards of integrity. Republican Senator Richard Burr told reporters that the committee had "two other campaigns that we're just starting on". Ms Stein's campaign is the first, and Mr Burr previously stated that former Democratic candidate Hillary Clinton's campaign might be the second. Ms Stein was photographed at a 2015 dinner in Moscow at the same table as Russian President Vladimir Putin and US President Donald Trump's former national security adviser, Michael Flynn. In the statement, Ms Stein said that documents would prove that, "we did not accept any payment or even reimbursement for the trip". The request for Ms Stein's documents suggests that the investigation into Russian interference in the 2016 election will continue well into 2018. 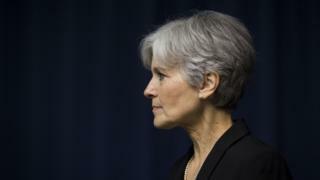 Ms Stein received about 1% of the popular vote in the 2016 presidential election. Trump-Russia inquiry: How did we get here?